Evan Jacoby is a regular contributor. You can find him @evanjacoby on Twitter. TT4 will cover four selected teams of interest – Syracuse, Indiana, Murray State, and UNLV – by tracking their ups, downs, and exciting developments throughout the course of the season. Trending UP Because… – They put together perhaps their best performance of the season on Saturday by scoring nearly 100 points on the road at St. John’s in their only game of the week. Center Fab Melo returned from suspension for the game and had a solid individual performance (14 points, two blocks, 5-6 shooting), but it’s the collective play of the team’s defense and transition offense that is more telling of his impact. The Orange (23-1, 10-1 Big East) held its opponent to 38% shooting on two-point attempts, whereas they were allowing an average of 44.4% in three games without him. Melo was on the receiving end of several lobs in transition as the team consistently found easy offense in the 95-70 win. The Cuse look to have their swagger back and will try to keep up this strong form with two home games this week. This Week’s Key Cog – Michael Carter-Williams. This week was a reminder of how truly deep this team is. Carter-Williams is a McDonald’s All-American freshman averaging just 12 minutes per game this season, and he looked like the best player on the floor during his 17 minutes against St. Johns’s. The frosh had 13 points on 5-6 shooting, four rebounds, three assists, and just one turnover in limited playing time. Play of the Week – This was a no-brainer, as our guy Carter-Williams throws down a vicious dunk in transition that was one of the top plays of the week. Coaching Legend – Jim Boeheim continues his ascent up the coaching wins list. Saturday’s victory was the coach’s 879th career victory, tying him with Dean Smith for third all-time. The only men ahead of him are Bob Knight and Mike Krzyzewski, with Knight’s 902 victories a very passable number next year. Stats Central – Although Kentucky owns a near unanimous top ranking, the Orange have the far more impressive overall resume. If the season ended today (which, of course, it doesn’t), then Cuse would be the top overall seed of the NCAA Tournament, boasting the #1 RPI ranking and 12 victories over RPI Top 100 teams. Kentucky has seven Top 100 wins, by comparison. What’s Next? – Syracuse has two tough opponents this week, but both games are at home. First comes rival Georgetown on Wednesday (7:00 PM ET, ESPN), followed by struggling Connecticut on Saturday (1:00 PM ET, CBS). The Hoyas look like the second best team in the Big East right now, and the Huskies could be playing for their postseason lives come this weekend. It’s never easy against these talented conference rivals. Trending EVEN Because… – They did lose last week to a team in the mid-70’s of the RPI, but it was a two-point loss in Laramie against tough conference foe Wyoming. The Rebels had several chances to tie or win the game on their final possession of the game, and we can’t knock the team very much for this tight road game. They also easily disposed of Colorado State earlier in the week at home. UNLV (21-4, 5-2 MW) remains in good shape in the Mountain West and has a huge matchup coming up on Saturday. This Week’s Key Cog – Oscar Bellfield. The senior point guard averaged 14 points, 4.5 rebounds, and 5.5 assists in the two games over the past week and put his team in a position to win on the road on Saturday, but the late game shots just wouldn’t fall. Play of the Week – Here’s a beautiful no-look pass from Bellfield on the pick and roll to Quintrell Thomas for an easy dunk on Saturday at Wyoming. Road Warriors? – Make of this what you wish, but UNLV’s four conference road games have been decided by a combined 11 points. They are 2-2 in those games, two of which went into overtime, and they could easily be either 4-0 or 0-4 in these matchups. It’s unclear exactly what this means going forward, but it seems premature for analysts to be discussing the team’s potential downfall in games outside of Vegas when they are involved in so many close battles with conference foes in tough environments. Stats Central – Quintrell Thomas led the team with 15 points on Saturday, making it the seventh time that a different Rebels player has led the team in scoring during a game. Meanwhile, although Moser struggled with his shot in the game, he still had 11 points and 10 rebounds for his thirteenth double-double of the season. He remains third in the nation in rebounds per game and is the only player in the country with two games of 20 or more rebounds this season. What’s Next? – UNLV has only one game this week, but it is a doozy. Conference rival San Diego State comes into the Thomas & Mack Center on Saturday (4:00 PM ET, NBC Sports Network), in a battle for Mountain West supremacy. 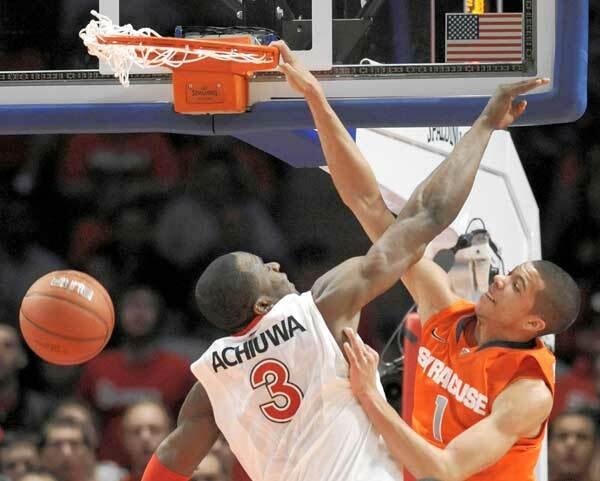 The Aztecs are 20-3, 6-1 in conference and won the first matchup on a game-winning basket. The Rebels are 5-2 in conference and need to win the game to keep up and make this a true two-horse race in the MW. Trending EVEN Because… – They took care of business with two wins in the past week, but not without a scare. The Racers (23-0, 11-0 OVC) trailed Southeast Missouri State by six points at home on Thursday night at halftime and were down by as many as 11 points in the second half before going on a massive run to go ahead and put the game out of reach. It was a perfect display of what this team is capable of, both good and bad, as they looked out of sync defensively against a solid offense in the first half, but then shot the lights out with aggressive play on both ends in the second frame. They also knocked off Tennessee-Martin on the road on Saturday. In the end, Murray State remains undefeated. This Week’s Key Cog – Isaiah Canaan. The mid-major superstar was his usual self this week, leading the team in scoring in both games while averaging 21.5 points, 5.0 rebounds, 4.0 assists, and 1.5 steals during the two wins. He took over the game against SEMO on Thursday when his team needed him, catching fire with a 6-11 performance from long range and several nice moves to get to the rim. Play of the Week – Watch a couple of huge Canaan three-pointers in this highlight that have the crowd going wild against SEMO. The Anthem – Perhaps this is not the finest moment in the Racers’ special season thus far. But some MSU students created a “Murray State Anthem” song on YouTube that has gone viral with an impressive amount of footage with actual players from the team. Stats Central – Prior to this season, the CFSB Center had drawn a sellout crowd to just three basketball games in its entire 13-year history. This season? The Racers have already played in front of three full crowds, and their next two Saturday home games against Austin Peay and St. Mary’s are already sold out. It’s a new era for Murray State basketball. What’s Next? – Two home games this week for the Racers. On Thursday, they take on Tennessee State (8:00 PM ET, ESPN3.com), and on Saturday is the rematch with Austin Peay (8:30 PM ET, ESPN3.com). Both teams are competitive in the OVC at .500 or better in conference play. Murray State will be strong favorites in both games, but be sure to follow along or watch on ESPN3 to find out if the unbeaten streak can continue into next week. Trending EVEN Because… – Indiana (18-6, 6-6 Big Ten) had to win one of their road games in the last week, and they got that done with a 78-61 victory at Purdue on Saturday. Of course, that was preceded by a double-digit loss in Michigan on Wednesday. Nonetheless, the Hoosiers finally got the road win that they desperately needed and now see five of their final seven remaining games at home. Their two road games are at Iowa and Minnesota, both winnable games as well. Now is the time for Tom Crean’s team to make its late season surge. This Week’s Key Cog – Victor Oladipo. The sophomore guard was huge against Purdue, collecting a team-high 23 points, eight rebounds, and four assists, as well as two blocks. He didn’t play great against Michigan, but nobody really did in the 68-56 loss. He did have six points and six boards. Overall, Oladipo was the best guard on the team and was huge in the latest victory. Play of the Week – Early in this highlight look for a couple of sweet layups by Jordan Hulls and Oladipo. Stepping Up – Lost in the team’s recent struggles is the fact that several new Hoosiers have become regular contributors during conference play. Freshman Remy Abell scored a career-high 13 points against Purdue, and Derek Elston has become a key reserve forward. He scored nine points against Michigan in 24 minutes. Stats Central – The roller-coaster ride continues. After a 96.6 offensive efficiency at Michigan, the Hoosiers put up a 116.4 in Purdue. IU will look to keep things running smoothly offensively with multiple home games coming up. What’s Next? – Just one game this week, at home against Illinois on Thursday (8:00 PM ET, Big Ten Network). The Illini are on the NCAA Tournament bubble and have just one conference road win, so they’ll be playing with a sense of urgency. Indiana needs a win in front of a packed crowd in Bloomington to kick-start the rest of this season. This entry was posted on Tuesday, February 7th, 2012 at 12:44 pm by EJacoby	and is filed under Regular Features, tracking the four. Tagged: anthony marshall, big east, big ten, big ten network, carrier dome, CFSB Center, cody zeller, dave rice, derek elston, dion waiters, donte poole, espn, ESPN2, espn3.com, fab melo, hoosiers, indiana, isaiah canaan, ivan aska, jim boeheim, jordan hulls, madison square garden, Michael Carter-Williams, mike moser, mountain west, murray state, MW, nbc sports network, ohio valley, Orange, oscar bellfield, ovc, Quintrell Thomas, racers, remy abell, runnin' rebels, scoop jardine, st mary's, steve prohm, syracuse, thomas & mack center, tom crean, unlv, victor oladipo. You can follow any responses to this entry through the RSS 2.0 feed. You can leave a response, or trackback from your own site.